I used to believe that everything would be okay. I used to believe that things would always be as they were. That achievement and love and health were more than just luck. I used to believe that tragedy only happened to other people. Until one day there was a seizure. And cancer. But still he was okay. I used to believe that a baby would make things whole again. A beautiful child with bright blue eyes and a happy smile. But now he cannot speak. I used to believe in science and medicine. That whatever could be diagnosed could be cured. I used to believe that "what if" was only pointless worrying. This poem was inspired by the novel If I Fall, If I Die by Michael Christie. The book is a coming of age tale of a boy who, because of his mother's agoraphobia, spends his childhood inside his house. 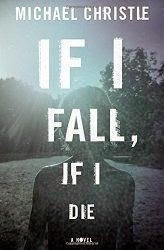 Join From Left to Write on January 22 as we discuss If I Fall, If I Die. As a member, I received a copy of the book for review purposes. Pizza and Parenting, a Metaphor! Tonight I made pizza for dinner. I've done this many, many times before. I'm pretty good at it. I made the pizza dough, preheated the oven, rolled out the dough, put on the toppings and baked. It turned out terribly. I had problem on top of problem today. I decided to make two smaller pizzas with different toppings instead of my usual one large one. My pizza stone was out in the garage, and the pizzas wouldn't work on one air bake pan, so I just planned to make them on a baking sheet. I put the sheet in the oven to preheat. I rolled out the dough, topped with everything but the cheese, and got ready to put in the oven. But I had a problem. How was I going to get the rolled out, already topped dough onto the heating baking sheet? I don't have a pizza peel. (How this is even possible?) The dough was thin and when I attempted to lift it, it just fell apart. Meanwhile, Moe was whining and crying and fussing about being hungry. Frazzled and rushed, I decided I'd just make the pizzas separately, got out air bake pans, and managed to get the first very messy dough transferred. I moved the second pizza to its pan a little more easily, but both crusts were stretched very thin. I baked the first crust for a bit, then topped with cheese. Otherwise, the cheese burns before the crust is baked through. As I put the cheese on the pizza I realized I had somehow bought fat free mozzarella. If you've ever used fat free cheese, you'll know that it is nothing more than flavorless rubber strings that do not melt well and belong on no pizza ever. But it was all I had. With the first pizza out of the oven, I still had hope. I sliced it, and tried to lift a piece. It stuck to the pan. Completely. In my haste, I had forgotten to oil the pan. What can I say? It wasn't my day. It happens to the best of us. I know I can make really great pizza but today, as Jeff said, "my head wasn't in it" and I mucked it up. Jelly has been into metaphors lately, and wow, what a metaphor this provided. How many times have we all made mistakes either because our heads weren't in it, or because factors just seemed to be conspiring against us? As a mother, especially of a child with limited communication skills, I rely on formulas—recipes of communication that usually give me a positive outcome. But sometimes I don't have the right ingredients, or I try something new, or I don't plan ahead correctly and I screw it up. But this kind of mistake is harder to let go. The stakes are so much higher and I want to get my interactions with Moe and Jelly right every time. But I don't. Sometimes I yell, or choose to give iPad time instead of engaging in a game, or cave when Jelly only wants crackers for dinner. I lose my patience with Moe. A lot. I will never get it right every time. And every time I read a blog post by a parent who has learned to no longer tell her kids to hurry up, who is always patient and positive, who never allows screen time and whose children make their own spinach avocado smoothies for breakfast every morning, I know I am going to screw up. Because parenting is hard. And parenting a tough kid is even harder. Much harder than making pizza. All I can do is remind myself of past successes and know that I'll probably get it right the next time. Or the time after that. Here are a couple of posts about times I've successfully made pizza!